So, Bejeweled 2 is now on your Wii. Why should you care? Well, in all honesty, most of you probably shouldn’t. This is as tame a port as could be imagined, and will most likely leave any regular gamer feeling a little underwhelmed. PopCap games, the creator of the Bejeweled franchise have done little with this incarnation to differentiate it from any other version you might have played. Indeed, it’s very much the same as the iteration on your phone. That’s not to say that it’s not a good game, and for the price of around seven quid, it’s worth it for any real fanatics. If you’re new to this style of game, be warned, it’s highly addictive, and has even led a man to spend over 2,000 hours over three years completing it. For such a simple title, that’s quite remarkable. It’s essentially a reworking of the Shariki principle, so PopCap can’t take full credit for the creation of such a powerful franchise. Essentially, it’s a block puzzler of the simplest form. You eliminate blocks by matching them up with two or more other blocks in a horizontal or vertical line. The blocks go boom, you get points and new blocks come to fill the void left by the explosion. Thankfully, there is a hint button that allows you to see what the next move could be, and it will automatically kick in if you leave too long between moves. Bejeweled 2 had a perfect opportunity to jazz itself up with loads of extra modes and gameplay mechanics, but that opportunity hasn’t been realised. And while the game is a little aged (there are so many variations out there, including Bejeweled 3), it would have benefited greatly from less lacklustre porting to the Wii. Things like the inclusion of your Mii are merely limited to your avatar’s face being displayed and shaking or nodding its head when you make a move. There are four modes to start with, although with most other versions of the game others are unlocked if you achieve stunning scores and specific (and hidden) objectives. They’re all much of a muchness though, and don’t offer you anything past the regulation mechanics. Puzzle, action, classic and endless modes really don’t take much explaining, as they’re the kind of modes from which you choose one and stick with it. Puzzle offers the most variation, having you solve puzzles with limited numbers of blocks. This is a mode for those with a specific type of brain function, or it can be used to break up the monotony of the endless modes. And, really that’s about it. 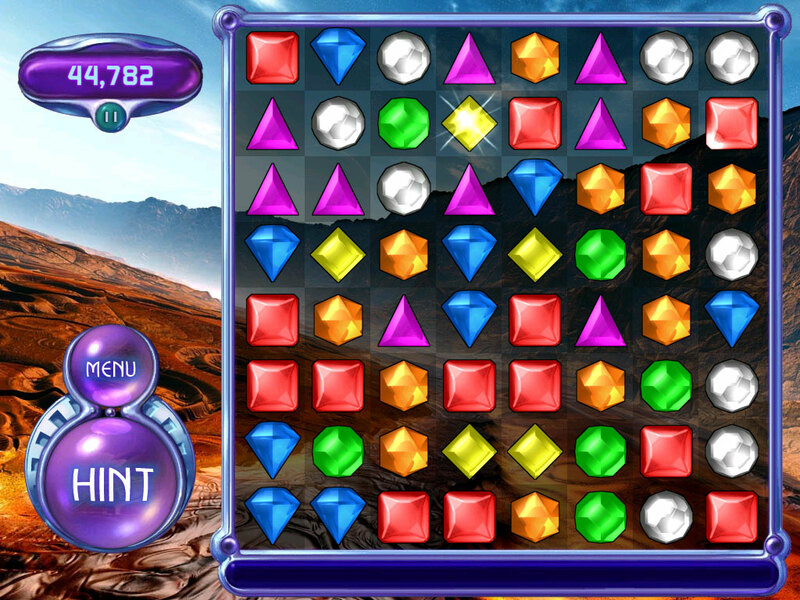 You probably already know if you’ll like Bejeweled 2 – and if you don’t, get a free flash version from somewhere online. If you like the idea of paying a few quid to have it on your Wii, and take advantage of the unique control system, then simply know that you have been warned: this is no different to any other Bejeweled 2 you have ever played, and, given it’s rather dated feel, isn’t something that’s easy to recommend to most gamers. This is a casual game that rose to popularity in the pubescent years of the Internet, and was a favourite with bored housewives looking for something to distract them from the monotony of stay-at-home life. This has been surpassed by Internet bingo and poker now, so one has to query the wisdom of releasing a version of this when the next version is already here. Still, it is the world’s most popular puzzle game, so there must be something to it.